Watched this for the first time; will post my write up tonight. Yes, I got mine from the library as well. 1. I liked this, though I wouldn't put it in my list of favorites. It has some good points and bad points, though I think the good points did outweigh the bad. I would watch this again, but probably only when I was looking for a fun adventure and nothing really deep. Knowing it was based on Treasure Island of course gave away the "twist" that John was a pirate captain and was going to lead a mutiny to claim the treasure for himself. But I wasn't bothered by that, really. The voice acting was really good, and put enough emotion behind the story that I was still entertained (even though I found myself just waiting for that reveal in the movie). I liked the blending of CGI and 2D animation for the most part. There were a few times where the CGI was distracting or felt like it didn't fit entirely. And I can appreciate what they were trying to do, but a few of the shots felt out of place or maybe meant to show off 3D. Like the one small shot where it went to...I think Jim's?...point of view looking around a room, and a few times where something was held closer to the "camera." I loved the interactions between Amelia and Doppler. It was predictable that they would end up together, but I enjoyed their banter back and forth that slow burned towards it. (The final scene was a nice nod to Lady and the Tramp, with three girl babies looking like their mom and one boy baby looking like his dad.) I could have taken or left B.E.N....mostly left. Part of it might be that I have a short tolerance for Martin Short, but also they tried to use him as the comic relief, which seemed to me to be incongruous with the tone of the rest of the movie. They already had a smart-alecky type (Doppler and his quips) and a physical comedy sidekick (Morph), so in addition to being incongruous he also felt redundant and slightly Deus Ex Machina-ey. 2. I actually found Jim to be one of the least interesting characters in the movie. I think I was just exposed to so much "KEEEEEEEEEEEEWL GUY who is just looking for validation" characters from that time period that he felt a bit stale. (He seemed to me like a cross between Max Goof from Goof Troop and Kit Cloudkicker from TaleSpin but in SPAAAAAAAAACE.) His character design screams that sentiment: The side of his hair is shaved! He wears baggy clothes and a big baggy jacket to hide his feelings! He rides a HOVER SURFBOARD!. I do think that Joseph Gordon Levitt did a great job with his voice acting, he had good chemistry with John, and his character motivation did make sense in regards to his childhood. I think I might have related to him more if I had seen this when I was younger, but it seems overdone at this point. 6 and 7. The overall goal of the film is to show us that anyone can be great, and where you come from does not dictate where you can go, but it won't just happen - you have to make it happen. It was summed up quite well with John's line "You got the makings of greatness in you, but you got to take the helm and chart your own course." I think the film did a fairly good job with this, building Jim from someone who everyone looks at like a troublemaker (including the requisite dropping off at home by the cops) to a military cadet after lots of time and hard work. This shot just kills me, and is one of the times that I connected with Jim. This comes shortly after the montage of Jim losing his dad juxtaposed with John as his surrogate father, and right after the scene where Mr. Arrow is lost. Jim is at a low place, since he is made to think that Mr. Arrow going overboard is his fault. John sticks by him, and Jim drops the cool guy routine and leans into his new surrogate father for support and it is just heartbreaking. It's also one of the quiet scenes in the movie, which are nice breaks between all of the action. The cluster intrigues me, since they included John on it. Disney is basically putting their foot down with this that John is more ally that villain, since no villains or henchmen were included on the clusters. So, I guess....Scroop is the main villain then? raikipins and coblj003 like this. Man, we've all been dragging tail when it comes to these analyses. I fear the next four weeks when we have two movies to review! Meritre, MerlinEmrys and coblj003 like this. We are in that rough slog right now where most of the movies just... Aren't as good. XD hopefully we will all perk up soon. I'm starving as I feed on Disney analysis and can never get enouh to read. coblj003, pretty Omi and MerlinEmrys like this. I'm posting from work and can't access the screencaps website so I'll just post a quick review for now and update/elaborate when I get home. This is one film that I have never seen until this past week and so to get a bit prepared I reread up on the synopsis for Treasure Island. It is not the first TI movie/inspired Disney has produced; As such there are deviations that are easy to point out or easy to see how this part was inspired. For instance, the use of Solar Surfing dates it as it was stand-in for windsurfing from when Extreme Sports was huge in the 90's/00's; the rock ballad also clearly dates the movie from the late 90's/early 2000's(boy do I feel old...). One of the techniques they used for the designing the movie was application of the 70/30% rule for the use of traditional vs steampunk elements. While it is interesting to showcase a universe similar to starwars/futurama, it was mindboggling how it forced them to use a 1700's era technology in futuristic setup up to including space travel; by comparison, Studio Ghibli's "Howl's Moving Castle" clearly showcases an 1800's era world with a fantasy/steampunk feel that doesn't give us disbelief in terms of what may happen as it is explained that magic fuels everyday life. 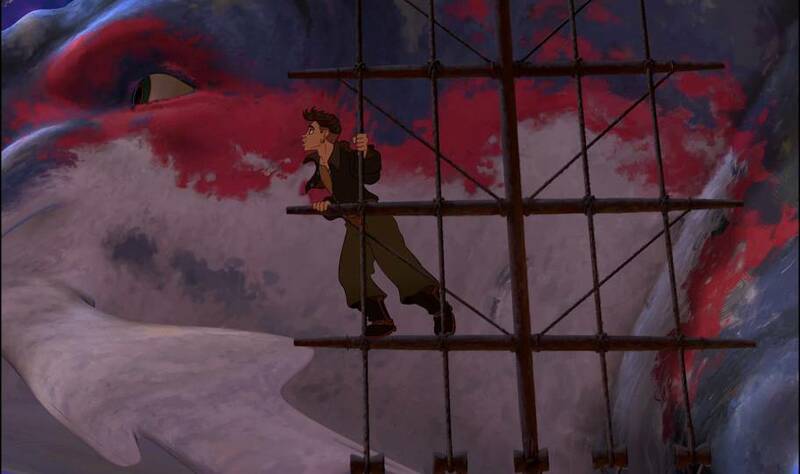 Character Development wise it leaves the two protagonists the same while tweaking a few of the supporting characters; John Silver is a a peg-leg cyborg that is still the captain of pirates, Jim Hawkins is largely the same but is made older (he was a child in the books) and given a dash of teenage angst as a backstory. Morph takes the place of John Silver's Parrot, made obvious as he copies/repeats everything a person says. Ben is now a amnesiatic robot versus a castaway. Dr. Doppler is the merge of two characters(Dr. Livesay and Squire Trelawny)from the book, while Captain Amelia takes the place of Captain Smollet. The latter two become romantically involved and later marry which is the largest deviation plotwise; Stevenson originally produced the novel aimed toward school aged boys and left out any female leads(other then Jim's mother) as romantic inclinations on purpose. In terms of story, it generally covers the same story as the original Treasure Island, which may actually explain parts of its clunkiness throughout. Along with the SciFi facelift, parts seemed to be adapted from other 80's/90's Movies. For instance, the part of finding Captain Flint body amongst the treasure seems like a scene taken from the Goonies; the book has them discover an empty chamber as Ben had already emptied it of it's contents. The Final surfing scene seems heavily inspired from the end of the Back to the Future ride as you travel across an erupting volcanic land before returning through a portal to safety. The element of finding an island of wealth is also explored in an earlier D2V film, Aladdin and the King of Thieves. Artistically, the merging of 2D elements onto a 3D backdrop was an interesting choice though in some cases I found it a bit jarring. B.E.N. was one of the more jarring things when you consider he was primarily 3D. There was one I had one major peeve that I didn't know what to think about and that was Jim's Facial Scar; unless it was meant to be a stylized dimple/cheekbone it always seemed to flip sides on either sides of his face throughout the movie. As a nod to Fantasia 2000, we actually see Sea Orca's flying around the ship. As mentioned before, I imagine that this Universe is a hodgepodge of steampunk/new space physics akin to an ocean as space exploration/technology seem to be interpreted very loosely to real life. My favorite scene is of Jim watching the stars from the mast. It shows his sense of adventure and wonder of what lies ahead, which actually underlays the feeling from the source material. Most of the pins and promotional material that came out around the film's premiere featured Jim solar surfing(in fact I remember seeing the diorama of Jim Surfing on Main Street Emporium at DLR around that time). 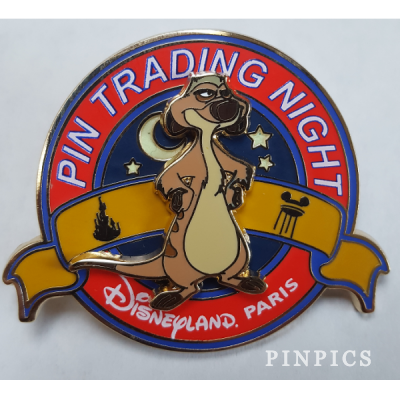 I like that this pin was offered to the studio animators who worked on the film, though you see the image reused several times for other pins. Overall, I'd call this one a bit flat. Silver is a fascinating character in just about any incarnation of TI. The animation for Silver here is ~really~ awesome. There's a great unity between the CG elements and the handdrawn animation which just leans into the entire cyborg angle. However, I got a bit back and forth over how much I like Silver and Jim's relationship. In the text, it's pretty out and out manipulative. Sure Silver cares for Jim some, but not to the same level as he does here. Going so far as to choose Jim over the treasure? That makes for a good film moment perhaps, but just rings false for the character. Again, I'm not normally a person who holds the film to the same standard as the book, but something about Silver here just didn't feel right. But I can almost forgive it for how good the Animation is. Character Side Note A) I really really really don't like Morph. He's too much. He adds this saccharine element that's just at odds with the spirit of the film. Character Side Note B) I also don't like Jim's character design. There's so much space between his eyes and his nose, so it makes his face so long. It's weird. My blu ray had some deleted scenes and showed the original concept for the opening prologue. And after seeing those, I realized how great the actual opening is. Moving from third-person story to seeing little Jim's head come up between the action is just such a cool move and immerses us in both the exposition and Jim's rapture. Also, it's a nice sort of "future version" of the classic Disney storybook opening, which I loved. I can't find quiiiiite the shot I want, but this will do. While I'm tempted to snag the cluster, I think this one is better for me. The surfing adventure energy with the sinister Silver cyborg arm. It's got all the right spots for me. *Speaking of being that guy, one small quibble I have with any TI adaptation is that Jim was ~traumatized~ by this adventure. He killed a guy for goodness sake! But the end of the book reveals that he wouldn't go back to that island for anything and the voice of Flint (the parrot) haunts his dreams. But any version always does this sort of "Wow what a great adventure!" Jim at the end. But in reality, he was totally disenchanted by the entire experience--and I like that a lot. *Muppet Treasure Island will always be the best adaptation. ;P "Cabin Fever, ahh!" coblj003 and Meritre like this. Since we've got two movies to do this week, I thought I'd better get started (even though it hasn't "officially" been announced yet). 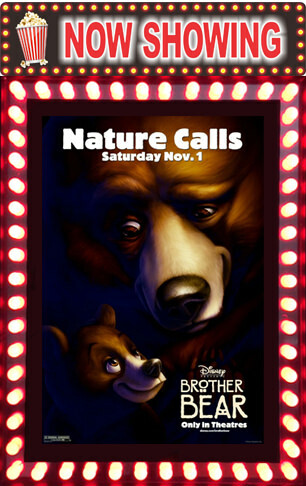 Welcome to “Brother Bear”, also known as “Phil Collin’s Disney movie… with bears”… Oh, this is going to be a long insufferable movie! Just like with “Tarzan”, this film is dominated (and ruined) by Phil Collins. More on that in #3 and #4. But Phil Collins makes this movie so unenjoyable and unbearable (see what I did there?) that I don’t really ever want to watch it again. “Tarzan” somewhat redeemed itself at the end because they stopped with the incessant and truly terrible Phil Collins videos and actually, like TOLD A STORY! I just don’t feel this type of redemption from “Brother Bear” (even though I would probably avoid watching “Tarzan” again because of PC). Besides the whole Phil Collins debacle, I did have some other issues with this movie. Mainly, it just felt like yet another Disney “ethnic” movie. Sometimes it seems like Disney is just “collecting” characters and movies. Do we have an Asian one? Mulan, CHECK. Do we have an African one? Lion King(? ), Princess and the Frog in the works?, CHECK. Do we have a Pacific Islander one? Lilo & Stitch (Moana to come), CHECK. Ooh, ooh, ooh. We don’t have an Inuit one yet. Better make “Brother Bear”. OK, so one of the few saving graces of this movie is Rutt and Tuke! I love Bob and Doug MacKenzie and “Great White North”, and they make a perfect addition to the movie. I love their Canadian accents and the way the two characters interact with each other. Great comic relief in a movie that does seem to be taking itself WAY too seriously. I also noticed that this movie has no real villain, in part because the goal of the movie is to show that good and evil are a matter of perspective (i.e., the humans view the bears as evil; the bears view the humans as evil). 2. I chose to analyze Sitka, Kenai’s oldest brother. He was the most mature and sensible of the three brothers, but he was also the peacekeeper. Normally this job falls to the middle sibling, but he definitely felt more like a father figure to Denahi and Kenai than a brother. Sitka was always looking after the best interests of his brothers, and ended up giving his life to save his two brothers from the bear—Disney went a bit heavy-handed in making his totem “the leader”, and took pains to show him to be a true leader in thinking of the good of his two brothers over himself. Sitka’s spirit also continues to look after both Kenai and Denahi throughout the movie. 3. and 4. (and 8.) The scene and song I chose to analyze is “On My Way”. It started out with Koda singing, and my first thought was “thank god it’s not Phil Collins singing the song”. But then, HE DID!! The song’s goal was to show the bonding between Koda and Kenai. (So far, this analysis was a direct copy of my analysis of the song in “Tarzan”, just changing character names…). Unlike “Tarzan”, I just couldn’t get over the whole ‘What the hell is Phil Collins doing in another one of my Disney movies? !’ vibe. The minute I heard PC take over the song from Koda, I said out loud: “And the Disney Magic is GONE!”. At that point, I just wanted to turn the movie off and go do something productive. I just didn’t even CARE what the scene was trying to convey. I’m just PISSED that PC has RUINED yet another Disney movie for me. I mean is it in his CONTRACT that his voice has to appear in every movie he writes the lyrics for? Man, what an EGO to think that he is more important than telling the story or that his annoying 80-MTV-video voice isn’t going to pull us all out of the storytelling of the movie. It’s just so jarring. I don’t remember feeling THIS angry when I watched “Tarzan”, but I was still pretty angry. I don’t think I’ll EVER watch “Brother Bear” again in my life, and if it weren’t for this critique I wouldn’t have finished watching it now. And if I EVER hear that Phil Collins is involved in another Disney movie, I will run like the plague! UGH! UGH! UGH! (I felt it needed three). In this movie’s context, Kenai and the humans view the bears as monsters who enjoy killing humans, while Koda and the bears view humans as the monsters who kill. And when we hear the bear voices, we see in this movie that the scary and threatening roars from the bears are actually plaintive cries to be left alone and not to be killed. Kenai evolves throughout the movie to see that what he thought the bears were thinking was not what they truly were thinking. 9. The only scene that really got to me was the end scene when Kenai is turned back into a human. What got to me was the look of fear on Koda’s face and his hesitance at approaching the “new” Kenai. What melted my heart was when Koda the bear hugged Kenai the human. It was very touching. 10. 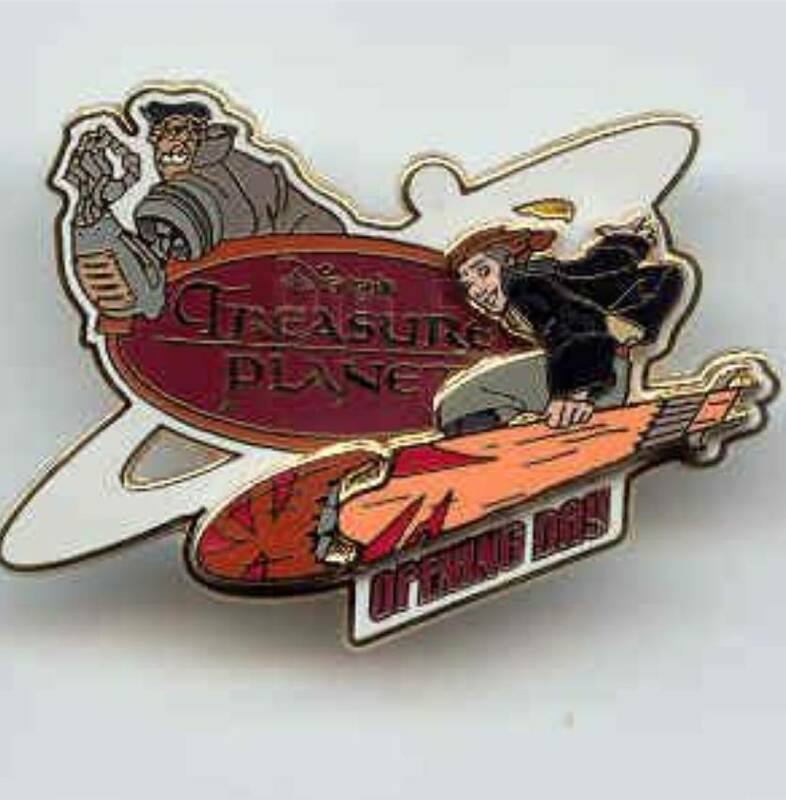 I chose this pin showing Rutt and Tuke (24930) because they are my favorite characters in the whole movie. Beauty, eh? Meritre and coblj003 like this. 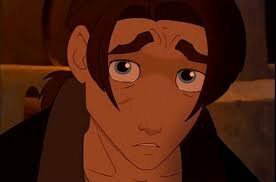 Monday/Tuesday is our "wrap-up" discussion on Treasure Planet. So you're welcome to respond to other analyses throughout the day. Also, in case anyone is wondering why I have LK 1 1/2 and Bambi 2 here in the challenge and no other Disney sequels, it's because both of these films return to the original movie and add something to it rather than continuing on from where the original left off. So I thought it might be interesting to consider how Disney revisits its own property and revises or reconsiders it so many years later (especially in terms of Bambi 2). I thought it very interesting that Disney opted for a midquel for Bambi because the original book did have a sequel - about Bambis children - written by the author of the original book Bambi. Maybe that is the very reason - the period Bambi 2 is about is mostly left out from the book and only mentioned once or twice. So they were free to do what they wanted. I think that was probably their mindset. They could kind of go off script, hahah! Not to mention, it's such a glaring hole in the original film that we jump that much time (I get, all films can't cover everything). But I did want a little more processing of the mother's passing. Which Bambi 2 gives us. OK, well I was rushing to get "Lion King 1 1/2" reviewed and came to post it. Since today is the start of the process, I might as well post it now! So, if “Lion King” is “Hamlet” and “Lion King II” is “Romeo and Juliet”, then “Lion King 1 1/2” is “Rosencrantz and Guildenstern are Dead”. Or as I like to call it “Timon and Pumba are Fed” (or perhaps “When Timon Met Pumba”—I’ll have what he’s having!). OK, voice issue again. Timon’s mom = Marge Simpson (“Marge Meerkat”??). It’s really hard not to hear his mom say, “Oh, Homer!” Speaking of voices, it’s great to hear Whoopi Goldberg (and Cheech Marin and Jim Cummings) reprise her role as a hyena. I love her comedy! It’s also cool that all of the other voices (Matthew Broderick, Robert Guilluame, etc.) came back for this movie. Timon’s puns were my favorite part of this film. When Timon and Pumba met, they ended up screaming at each other for a long time. Then we break the fourth wall, and Pumba seriously says, “First impressions are very important.” To which Timon replies, “Oh, I thought you were a scream!” Second pun was right after the “Can You Feel the Love Tonight?” sequence, when Timon says to Pumba: “I think this storm is coming to a head!” mere seconds before it transforms into the visage of Mufasa’s head! One of the things I really hate about this movie is the 2000’s sensibility that mocking gay couples/parents and transgender people is still acceptable. 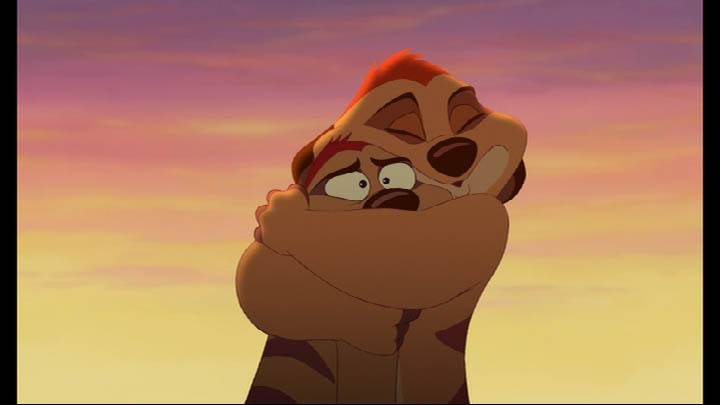 During the ‘Simba grows up’ scene, Simba calls Timon “Pops” and Timon calls Simba “Sonny boy”. So, we see the acknowledgment that Simba was being raised in an unconventional “family” with two male parental figures. No problem here yet, although they do play up the idea that two fathers (gays) are both going to be overly emotional (Timon saying at the end of the film: “I promised myself I wouldn’t cry”, as he cries) and singing show tunes (would you get male and female parents singing “Sunrise, Sunset” with quite this much emotion? I don’t think so). My big issue comes from Uncle Max, who apparently has a problem with Timon living with Pumba and raising Simba because he is wearing a dress! So, it feels like Uncle Max is conflating being gay with being transgendered, and it feels very derogatory. Max disapproves of Timon wearing a flower on his head and a hula skirt because it (presumably) is diminishing or negating Timon’s masculinity (“He’s wearing a dress!”). It also appears that, because Uncle Max is already questioning Timon’s masculinity, he also disapproves of his “relationship” with Pumba, obviously assuming it’s more than friendship (which, being in a gay relationship, would also cause Max to question Timon’s masculinity). I don’t feel like the writers were trying to be offensive, but it’s clear that they just weren’t thinking about what this whole scene would actually say to gay and transgendered individuals. 2. Well, I analyzed Scar for “Lion King”, so I guess I’ll analyze Timon this time. This movie works harder to flesh out Timon’s character while not changing him drastically from the first movie. So, Timon is given the timed-tested trope of the misfit that doesn’t fit in and can’t seem to do anything right (dig tunnels, scout for hyenas… That’s all meerkats have to do right?). So, Timon goes on a trek/quest to find his place in the world. Timon focuses on the fact that “nobody likes him”, so finding Pumba and making a friend is a logical conclusion of his quest. Timon is on the selfish side (taking the larger bed and not even thinking that Pumba would need the bigger bed; focusing on the loss of Simba as ruining his Hakuna Matata, etc.). Timon does have a bit of a redemption in that he finally realizes during his “conversation” with Rafiki that he needs Pumba and Simba, and that they need him too. 3. and 4. (and 8.) Although I analyzed “Circle of Life” for “Lion King”, I decided to analyze the “Peter Gunn”/“Can You Feel the Love Tonight” this time. The premise of the song is still similar to that in LK—Simba and Nala falling for each other, Timon fearing that they will lose their friend and protector, and Pumba not so sure that the Simba and Nala love connection is a bad thing. Since this movie is from the perspective of Timon and Pumba, it’s interesting to see in the “Peter Gunn” sections that Timon was actively trying to break up Simba and Nala and ruin the “special moment”. In a nod to fatalism, everything that Timon does to try to ruin the love connection makes it stronger and more romantic (spider = spider web with hearts, tripping Simba and Nala = butterflies swarming and flying around them, etc.). This fatalistic view matches Silver’s quote in “Treasure Island”—“Sometimes plans go astray.” I love the way the editors changed between the “Peter Gunn” song, showing Timon trying to ruin the moment, and the quick segues into “Can You Feel the Love Tonight”, showing Timon’s failure each time and the burgeoning love between Simba and Nala. 5. OK, so it’s not a symbol exactly, but I thought I’d talk just a bit about Timon’s terrible digging skills. The movie sets up that Timon can’t seem to stop himself from collapsing the meerkat tunnels. That makes him a misfit, and he decides to leave and find a life of his own where he isn’t a misfit. But, of course, the tired trope of “turning your most negative aspects into a positive to save your friends” is employed, and Timon must help collapse the tunnels dug by his mother and uncle because he’s just so darned good at being a klutz and collapsing tunnels. Happy ending for all! I guess it just bothered me because it wasn’t needed to show Timon’s growth and just felt gratuitous. I mean, there’s no reason why Uncle Max couldn’t have successfully collapsed the tunnel, and BOOM!, same happy ending. 6. and 7. The movie sort of hits us over the head with this quote (“Friends stick together ‘til the end.”), so I thought I’d use it. I also think that this is the goal of the movie, to show that Timon and Pumba’s (and Simba’s) friendship is strong enough to last through any trial or tribulation, and more importantly, that this friendship actually HELPS them get through these trials and tribulations. The movie is a bit heavy-handed with it in Timon and Pumba’s discussion before Pumba leaves, and Timon needing to literally be hit over the head by Rafiki (although Timon literally asked Rafiki for it). But finally, Timon gets it and joins Pumba to help Simba fight off Scar and the hyenas. 8. 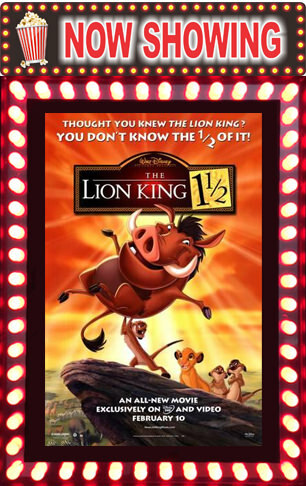 You know, this movie bears a striking resemblance to “Lion King”, and tends to steal a lot from it… It is kind of cute to see how they frame some of the more iconic scenes in “Lion King” in terms of Timon and Pumba’s behavior and ultimate responsibility for them. For example, Pumba’s flatulence is the REAL reason the animals bowed at Simba’s Presentation at Pride Rock, and Timon smacking the elephant in the leg caused the animal pyramid to fall in “I Just Can’t Wait to Be King”, etc. Aside from “Lion King” (and the whole pantheon of Disney characters in silhouette during the credits of the movie), this movie also has a lot of connections/similarities to “Emperor’s New Groove”: (1) First of all, both movies break the fourth wall pretty substantially, and neither movie takes itself too seriously; (2) When Timon says “bring it on” and then we see a waterfall, I immediately thought of Pacha and Kuzco tied to a log and going down the falls; (3) The whole “Dream Home” song feels exactly like “Perfect World” from “Emperor’s New Groove”. I kept expecting to hear, “Ti-mon!” in lieu of “Kuz-co!”. 9. I couldn’t really think of a scene here that is decidedly LK1.5 versus a scene that also feels like LK. So, I just picked this one with Timon, Pumba, and Simba sleeping because this film does ultimately feel like it is about Timon and Pumba and the little cub they raised to be king. 10. Well, most of the pins for these characters are for the original movie. So, I chose this pin (45703) which features Timon and Pumba and a topiary Simba, in part because this movie is all about Timon and Pumba, and in this movie Simba isn’t the star but is instead “shrubbery”, a side character that blends into the background. MerlinEmrys, pretty Omi and Meritre like this. timeerkat, coblj003 and MerlinEmrys like this. 1. Overall I like Brother Bear. It's not a very deeply meaning movie past the message of brothers being who you choose to love rather than just your blood relative, but it's fairly cute (aside from the bear murder) and a fast watch. None of the characters are particularly annoying or offensive, and they used Rutt and Tuke (the comic relief) sparingly enough to not make their appearances tiring. 7. This film has two big messages. 1 - Family is what you make it to be. In the beginning, Kenai only considered his own brothers, and to an extent the rest of his tribe, his family. Through the course of the film, he comes to care for Koda just as if he were his own brother, and he and we learn that family can be just as much who you choose as it is who you are bonded with through blood. I think the film did a good job conveying both of these messages. By following Kenai's journey with Koda, we learn these as we watch Kenai learn them, too. 9. My most iconic shot is the very end scene, when Kenai gets to add his pawprint to the wall that shows he has embraced his totem. I love this shot because it shows Kenai with all of his brothers (Koda, Denahi, and Sitka as the eagle watching over them) and that family is not just blood, it can also be who you choose to love. 10. Brother Bear has very few pins, and the majority are very similar to each other (just a generic pose of one or two of the characters). I chose this pin, because it shows Koda and Kenai at the salmon run, where their bond as brothers really started to cement. 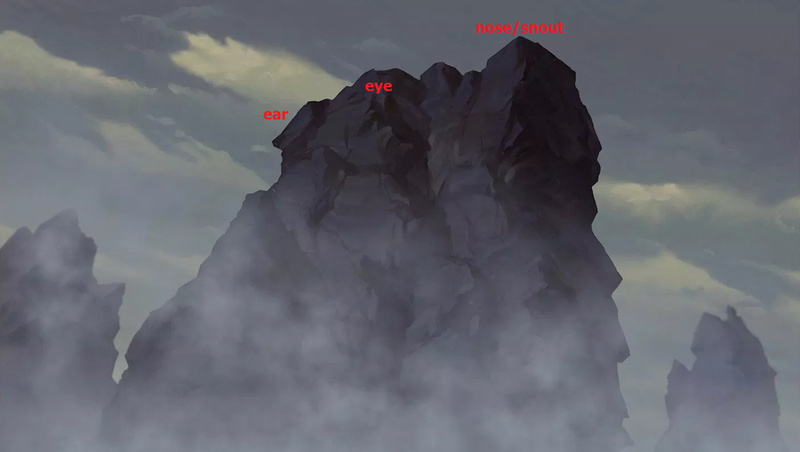 ~ Did anyone else notice that the mountain that Kenai kills Koda's mother/transforms into a bear on actually looks like a bear itself? It reminds me of Grizzly Peak in DCA. ~ Oh gosh, that movie poster. I forgot about that tagline. They actually used a pee joke. As their official tagline. WHYYYYYY Disney, why you do? ~ How did Tanana know where to find Kenai after he transformed? And why didn't she warn the other humans that he was a bear (especially Denahi)? I could understand her not sharing everything with Kenai so that he learned the lesson himself, but it sure would have made everything less deadly for Kenai if Denahi knew who he was. And if she could find Kenai, she should have been able to find Denahi since he was so close by. 1. I don't think it's any surprise that I really like this movie. Yes, I am supremely biased, and no, I don't care. It's not my favorite (original Lion King, Robin Hood, Zootopia, Inside Out, and even Bolt beat it out), and it's not even my favorite Lion King sequel, but I love that it's a full-length movie that focuses on my favorite character ever. And it did a great job of fleshing his character out more. The animation itself looks really nice. The lines are nice and crisp, and while it differs from the original's somewhat sketchiness, it doesn't feel out of place as a Lion King movie. It also allows the characters to have much more defined facial expressions. This above all other items in the Lion King franchise is the most wide-ranging and expressive in terms of range of facial expressions. I love that they got as much of the original voice cast as they could; I think Rowan Atkinson was the only one that was replaced. (Well, and JTT, but his voice had changed too much by that point to match.) Vitally important were Nathan Lane and Ernie Sabella. If they didn't reprise their roles as Timon and Pumbaa, I think the film would have suffered. I think the way they incorporated Timon and Pumbaa into many of the scenes from the original, showing them from their perspective and how they influenced the events to make them happen was usually pretty funny and clever, though they seemed to take liberties with the timeline a bit (for example, it seemed like only overnight between the Presentation of Simba and Just Can't Wait To Be King). Now for some of what I didn't like. The bodily function jokes got a bit old after awhile - the bit with Pumbaa causing the animals to collapse during the Presentation of Simba was clever, but when it got to the part where Pumbaa was making the bubbles in the pool, it felt stale. I also was not a fan of the silhouette cut scenes. There were too many interspersed throughout, and most felt like they were put in to make a cheap joke or to fill out time. They could have easily just used voice-over narration instead of pausing the movie and cutting to Timon and Pumbaa in the theater. And Uncle Max's "My nephew is in a dress!" line didn't sit very well with me and seemed as if it was just put in to get a laugh (though at least none of the other characters reacted as if it were funny). Ma is a refreshing change from the way mothers are usually depicted in Disney movies (either dead, or in the case of stepmothers, wicked). She comes across as somewhat overbearing and overprotective; this comes from her desire to protect him from the disappointment and anger of the other meerkats. It seems as if Timon is her only child, and this may also contribute to her overprotectiveness. When Timon tells her that he wants to go off into the world, she tries to stop him at first. Meerkats are a prey species, and survive best when they are with lots of other meerkats to act as lookouts. One lone meerkat by himself is vulnerable (especially one who isn't great at lookout duty). However, she does ultimately realize that Timon is unhappy with his current situation and the best thing for him is to go off on his own to find his place in the world, even if it is dangerous. Also, props for her character design! Whereas usually they really "girlify" up the female characters, they drew her as *gasp* a STANDARD MEERKAT. She is not overly feminized (in fact, it would be hard to tell her gender at all by her photo alone), which is a true reflection of actual meerkats. (To digress a bit, that is actually true for the majority of the meerkats. There are a few exceptions, but in general, it's hard to tell the female from the male characters in this shot. The closest they get is making the noses smaller on the females, but some of the males have smaller noses too. Julie Kavner was actually a great choice for Ma, considering her other big animated role is Marge Simpson. Ma shares many of the same traits as Marge - she is motherly and wants the best for her kids, but actually lets them deal with the world largely on their own. She encourages them but lets them make mistakes and do things their own way. 6. This film is great with wordplay (especially with That's All I Need). So while it may not be profound or deep or even relay the message of the film, I've always loved Timon's line "We're gonna get old walking across this thing." after the third or fourth time of Simba waking him up in the middle of the night. It's a fun wink to the first movie when they literally show Simba aging across the log during Hakuna Matata, which is also funny when you consider Timon is anything but worry-free when he's dragging himself across it in the middle of the night yet again. 7. The message that the film bashes us over the head with multiple times is that true happiness comes from helping your friends. Selfishness may get you what you think you want, but you just end up lonely and ultimately unhappy. Compromise and sacrifice for the benefit of our friends brings them happiness, which in turn brings us happiness as well. Timon is used as our proxy as he comes to learn this through the course of the film. This shot is right after Timon decides to be selfish and stay put in his jungle home while everyone else goes off to help Simba. This is when he is at his lowest, and starts to realize that his friends are what make him happy, not just a specific location that is deemed to be "home." He visits a few locations like this, but this shot with the next in the jungle as it zooms out to make him seem smaller is the most effective to me. Runner up to this, because this is exactly what I would do if I were teleported into The Lion King. I would friggin' hug that meerkat SO DAMN HARD. 10. There are, as far as I know, only two pins in existence that are very specifically Lion King 1 1/2. (Any stand-alone character pins out of context of the sequels I assume are meant to be from the main movie.) I am including them both here because this film needs more pins specific to it, dangit! They need to come out a pin for Ma. At this point I think the best shot at this will be PTDs, though it probably won't be for a good long while if ever. The next best shot would be PTNs, considering they already did Uncle Max and have done other obscure characters from other movies before. It’s been quite a while that I saw this movie but it was actually quite nice. I kept switching between English and Hungarian dubs. Another movie with sibling relationships, this time between brothers. I really liked all the sibling relationships, both between the three human brothers and the bearbrothers. I expected Koda to be annoying (and he was, in a way) but I actaully liked him. He reminded me of young Simba but that may have to do with our other movie for this week. I’ll go with Koda since he was my favourite. I think they balanced him quite well, he was believeable as a cub, he acted like a cub but wasn’t too annoying as many younger sibling characters. Sometime he is quite mature for a cub – well he is a wild animal there are lots of dangers so he has to be smart if he wants to survive. But he is also very much like a cub, willing to try new thing hat seem fun, like riding mammoths or standing in the wind. Although he is still young he is Kenai’s key teacher during the movie, it is through him Kenai learns about brothers, taking responsibility and love. When Kenai goes after the bear after the bear after Sitkas death, the colors are a little muted, (not as bright when spring comes at the top of the mountain with the lights) ahowing the grief of the Kenai. The music also helps building up tension. We look around with Keanis eyes, become cautious whe seeing the bears footprints. And when the watchers are sure the bear is going to turn up – music, a small section of brown fur – it turns out it’s a chipmunk. Just as Kenai we feel we’ve been tricked. And then the bear comes, when she wasn’t expected any longer to appear. The watchers expected one thing but got something quite different, using colors and music. All of the totems are obvious choices. But it is already told in the movie what they stand for. I also thought that the fling eagle looks like an arrow – pointing to the direction you should go. So I choose the spears instead. They stand for violence and fight and bad decisions, a hindrance the brothers have to oversome. The animal counterpart is the bears claws. They hurt each other with them and they have to put them aside to solve their problems. The brothers also hurt each other with words while holding spears after Sitkas death. Also, Denahi kasts his aside while saying that killing the bear is wrong. I choose this one because I thought the translation touched a really important thought and sums up the movie and its goal really well. It not only means that we have to understand each other but also that we listen to each other (so we understand what the other party is trying to say. Communication is key.). And also that speaking different languages (animal language, human language) need not to be a hindrance, love can build a bridge over these rifts. It can be handled by us, down here on earth, a little help, guidence is needed from the spirits is needed but tey don’t and needen’t do it all for us. And if only the spirits communicate, those who already left earth that is really sad and causes problems so communication has to be started on earth already. Quite messy but I hope it’s underestandable what I was trying to say. I think it teaches about family (the two younger brothers), love (bearfamily), friendship (moose) and responsibility. Kinai experiences these all and becomes a better person. He takes responsibility for what he did (killing Koda’s mom) and tries to fix it. Also learning about these things makes someone truly an adult and not their age. The lights at the beginning reminden me strongly of the wind in Pocahontas. And in the Pocahontas sequel, there were animal shapes in the wind, just like in the polar light. Also the first song reminded me of the opening song from The Lion King – animals, people gathering for an important event, somehow the scene felt similar. Also Koda himself reminds me of young Simba and there were quite a few moments when It remined me of scenes from The Lion King – like when Denahi catches up and chases them – it’s like a mix of Mufasa saving Simbe from the wildbeasts and the Elephant Graveyard part. The mountain and the light touchin the earth seemed pretty iconic to me. I wasn’t really happy with any of the pins but I guess brothers are what sum up this movie best? I choose this one because I think that the set this pin comes from does the best job of being iconic and summing upthe movie. @Meritre Your analysis makes me see the similarity between Sitka's and the mother bear's death. Both were willing to sacrifice themselves for their family. Sitka died to protect his two brothers from the mother bear, and the mother bear sacrificed herself to protect Koda from human Kenai. The similarity shows the "sameness" of the humans and bears, that they love someone else more than they value their own lives.